715,00 € Tax incl. 595,83 € Tax excl. The Range Vision turntable is designed to scan small to medium objects such as items of jewellery and precision parts. The scanner is fully integrated and compatible with software for 3D Range Vision scanners, making your scan simpler and faster. The turntable from Range Vision is compatible with all scanners from the Range Vision range such as the Smart, Standard Plus and Advanced. The turntable supports objects weighing up to 4 kilos. 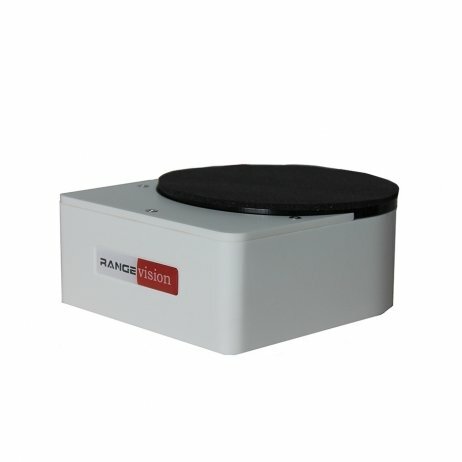 This turntable is ideal for professionals wishing to scan small parts, and is very easy to use. Once configured with your Range Vision scanner, you can perform all your 360° scans very quickly. Moreover, it’s connected directly via a USB cable and requires no additional power source.